For this week’s Historical Horizons blog post, I’m excited to launch the inaugural edition of our “Ask the Author” series. 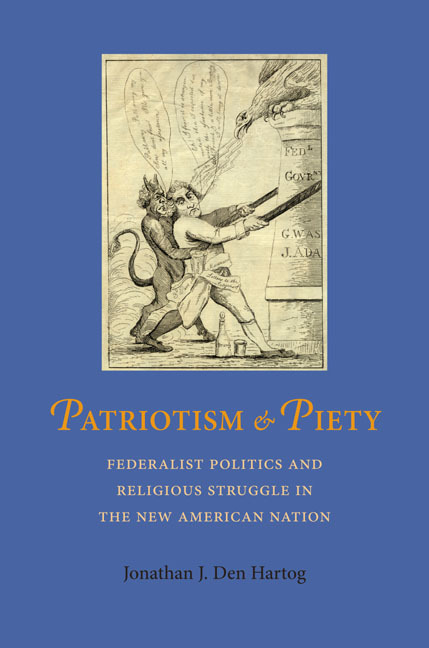 I’ve selected a new book on religion and politics by Jonathan Den Hartog—Patriotism and Piety is fresh off the press, and Jonathan was kind enough to take some time to talk about the book. 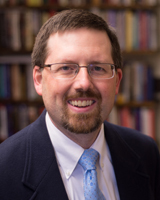 Jonathan is chair of the History Department at the University of Northwestern – St. Paul, Minnesota. He has his own blog over at Historical Conversations, and contributes monthly to the Religion in American History blog. KDM: Let’s start with the cover—tell us about this wonderful image. JDH: First, thanks to Professor Du Mez for the invitation to do this. I’m delighted to be present on Historical Horizons. The book’s cover. Click the image for a better view of the cartoon. I like the cover quite a bit. I actually uncovered the illustration after the book was nearly completed, so it doesn’t show up in the text. Still, it captures quite a lot about the book. A close investigation will show the Devil helping Tom Paine try to pull down the federal government. To Federalists, this was exactly the stakes: the American republic under Federalist leadership was being attacked, not just by opponents, but by dark spiritual forces. Thus political arguments simultaneously had a spiritual dimension. I talk more about the illustration here. There’s a story to every book. How did this book originate? The book has its roots in my dissertation at the University of Notre Dame. I wanted a topic that addressed religion and politics in the early American republic, and the Federalists fit the bill. They needed more attention than they had received. All will be grateful to learn, though, that this isn’t just a dissertation: the entire book has been revised, and I added several additional chapters to address more perspectives. What sorts of twists and turns did your research take you on as the project developed? Early on, I had a great “Aha!” moment when I realized the first two presidents of the American Bible Society (Elias Boudinot and John Jay) had been very active Federalists earlier in their career–that seemed worth investigating. To understand the Federalists, though, required lots of travel to multiple archives, which led to some great finds and some sketchy places (the short-term lodging in New York City, a Super-8 in Charleston, South Carolina). What do the Federalists have to do with this? I wanted the book to focus on real people in the period, people wrestling with important questions. As a result, I traced developments through the lenses of real people. Some of them such as John Adams, John Jay, and Timothy Dwight may be known to people, but others were active leaders at the state and local level. I think the stories of people like Elias Boudinot, Caleb Strong, Henry William De Saussure, and William Jay both deserve to be told and can be fascinating in their own right. What was the most difficult part in writing this book? First, there was the writing–any author has to struggle to craft his or her ideas into actual, probably imperfect, words on a page. Second, the wheels of publishing can turn slowly, so working then waiting created an irregular process of pushing the book toward completion. What was your best discovery in the archives? Rather than a single document, I think my best discovery was finding all of the times the characters in the book wrote to each other. Rather than disconnected figures, they formed a network of Federalist leaders who knew each other, communicated with each other, and cooperated in endeavors political and spiritual. You teach at a liberal arts college. How were you able to balance teaching demands with research, and do you have any advice for others trying to do the same? My first word to readers of Historical Horizons would be that if they know others who are teaching in a liberal arts setting and writing that they should encourage and appreciate them! I found that I had to prioritize the work, that it had to come out of a self-motivation of getting it done. To achieve that often meant the sacrifice of nights, Saturdays, and breaks. A lot has been said about religion and politics in America. Are there specific things this book tells us that help us to better understand contemporary issues and debates? I was first drawn into this period by questions of religion in the Revolutionary era. What I discovered was that many of the American founders disagreed (!) about the place of Christianity in the new nation. These differences then got fought over quite heatedly in the decades after the Constitution was put into place. So, rather than a founding with a single religious consensus, the new nation witnessed intense debates over religion in public life. Contemporary debates and arguments then should not be surprising but should be welcomed as part of an open discussion that’s built into our republic–and has been since the beginning. Besides your own book, what are the 2 or 3 other essential books you’d recommend for someone trying to get a handle on religion and politics in American history? For the 19th century, my favorites are Nathan Hatch’s The Democratization of American Christianity and Daniel Walker Howe’s The Political Culture of the American Whigs. To understand religious engagement in politics since World War II, I would recommend a trio of books: Daniel Williams’s God’s Own Party, Darren Dochuk’s From Bible Belt to Sun Belt, and George Marsden’s The Twilight of the American Enlightenment. Each brings a different interpretation, but each is good for helping to understand dimensions of contemporary political engagement. (And, for a very different perspective, readers could also pick up David Swartz’s Moral Minority). Many thanks again to Jonathan for the interview! This entry was posted in Kristin Du Mez and tagged Ask The Author, book note, Federalists, history, Jonathan Den Hartog, Patriotism and Piety, religious history, US history. Bookmark the permalink.